"Perhaps the most important aspect of this demo - from a technology standpoint - is the inexpensive equipment that we used for real-time air-to-ground data communications," said Hans-Werner Braun, HPWREN PI. "To make real-time data available from airborne vehicles is nothing new; however, to make this high-speed link work with relatively inexpensive off-the-shelf equipment - that is the interesting part of the experiment." Directed by ecophysiologist Walter Oechel, SDSU's Global Change Research Group uses the NSF-funded Sky Arrow 650 TCN ERA (Environmental Research Airplane) in conjunction with their research in extremely remote areas, such as the northern slope of Alaska. Specifically, the Sky Arrow is instrumented for remote sensing and net ecosystem carbon flux. The main goal for the GCRG's aircraft is to determine the patterns and controls on ecosystem level metabolism and carbon sequestration, and to determine how ecosystems may respond to and affect global climate change. "Studies using this aircraft should lead to better management practices to maximize the removal of carbon from the atmosphere, and to help ensure the health of native ecosystems. Real time, high-speed wireless transfer of aircraft data to the ground could help solve on-board data storage problems, and allow for real-time observation data analysis," said Oechel. "The educational potentials for an aircraft program with high-speed wireless data transfer are nearly endless." The April 9 experiment assessed the possibility of creating and maintaining a wireless connection between the Sky Arrow and a ground station. An airplane creates special difficulties for this type of connection because it is in motion and because the antenna cannot extend too far from the airplane. Still, a partially visible antenna mounted to the belly of the Sky Arrow and extending out six inches did produce a working connection. After removing the passenger seat, the team installed the radio with its amplifier and antenna and also added a laptop to track the output of a GPS receiver. 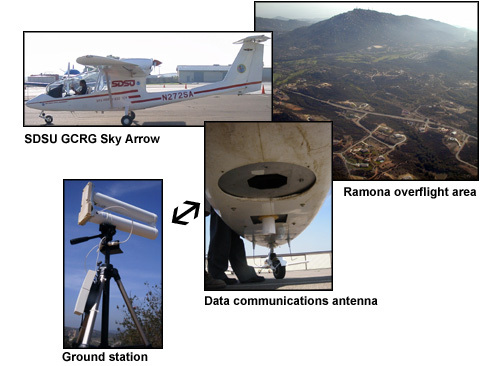 The objective of the fifteen-minute flight across a 4.5 square mile area was to judge the conditions under which this technology could maintain the air-to-ground connection as the plane flew from the Ramona airport and passed over the ground station. After the flight, when the receiver's data was compared with radio signal performance on the ground, the team found that the connection was maintained for the majority of the flight. The experiment proved that using low-power ground-air communication across relatively short distances is possible, and experiments of this type are expected to continue with different antennas. "We next aim to use smaller antennas that can be used with great ease," explained Braun. Eventually, the GCRG hopes to use this technology "to support people on the ground in a research or incident area with real-time data via an airborne vehicle," Braun said. An example of this could be support of firefighters in a wildfire situation, in need of images and other sensory information." Photographs regarding Sky Arrow and additional HPWREN mobile node activities are available at file:///D:/Kim/HPWREN/web/hpwren/Photos/techno.html#Mobile. Additional information about the SDSU Global Change Research Group can be found at http://www.sci.sdsu.edu/GCRG. Additional information about the SDSU Field Station Programs can be found at http://www.sci.sdsu.edu/BFS/.